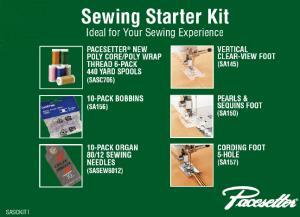 Designed with Brother Sewing Machines in mind, the PACESETTER® SASCKIT1 provides a group of key items you’ll need as part of your Sewing Projects. Included are the following items: 1 set of 6 different color spools of 40 weight XP Poly Core/Poly Wrap Sewing thread specifically designed for Brother Sewing Machines; 1 set of 10 Organ Brother OEM sewing needles; 10 Brother OEM empty bobbins; 1 clear view accessory foot; 1 pearl and sequins accessory foot; 1 cording accessory foot. An Exceptional Value for your sewing needs! For Use With: Innov-ís 2500D, Innov-ís 1500D, Innov-ís 1200, PE-750D, Duetta® 4500D, PE-700II, Innov-ís 900D, SE-350, Quattro™6000D – New!, LB6770 PRW, Innov-ís 2800D – New!,Innov-ís 1250D – New! PLUS most other Brother models that use SA156 class 15 bobbins.